Like most companies, Stardock puts together an internal business plan for setting up goals and objectives for the company for the forthcoming year (Stardock's fiscal year begins its execution phase every October 1). As part of this business plan is an appendix that acts as a critical analysis of what Stardock customers can expect to see and what challenges the company faces to better satisfy customer expectations. For this year, it has been decided to make this appendix available to the public. 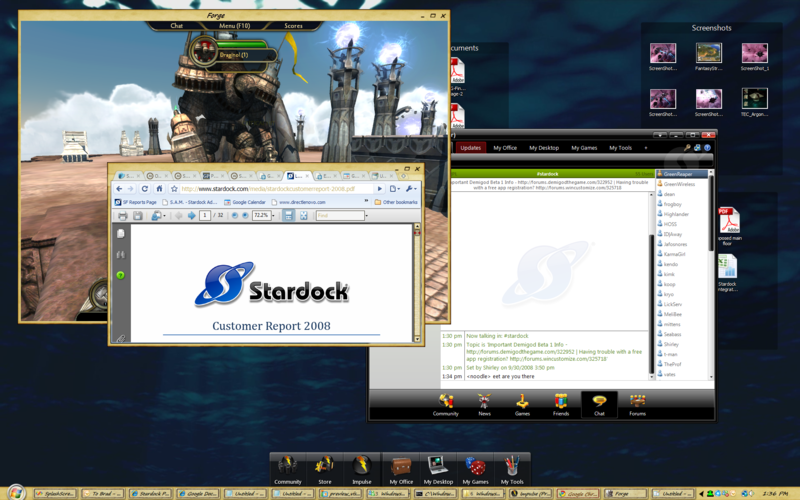 The Stardock 2008 customer report goes over some of the successes Stardock has experienced but also looks at the failings with a considerable amount of criticism in areas that the company needs to improve on. A look at the dock technology now used by Dell and others. If you're interested in the inner workings of a consumer PC software company, you may find this document to be very interesting. Very significant article for us, I think the representation of this article is actually superb one. This is my first time to visit your site. I definitely bookmark it for sharing with my friend. Very interesting that you would post this - shows how good you guys are! Love love LOVE the game. I really like what you guys are usually up too. This type of clever work and coverage! Keep up the excellent works guys I’ve added you guys to blogroll. Many thanks for posting this, It’s just what I was researching for on bing. I’d quite a bit comparatively hear opinions from an individual, barely than an organization web web page, that’s why I like blogs so significantly. Many thanks! Thank you sharing NEWS, Fujifilm Finepix J100 Battery Charger input is 110-220 Volts, So it Works in every country in the world. The Fujifilm Finepix J100 Charger is for charging your battery only. It does not work as AC adapter for your digital camera. Fujifilm FinePix Z37 Battery Charger input is 110-220 Volts, So it Works in every country in the world. The Fujifilm FinePix Z37 Charger is for charging your battery only. It does not work as AC adapter for your digital camera. I harmonize with your conclusions and will keenly look further to your future updates.